Overall, Ambergris Caye is the priciest place to live, play and eat in Belize. You can go save tons of money by living in Belize out in a small village in the bush but then…you are in a small village in the bush. I’m sure it has its attractions but no where near as many as San Pedro. Some people prefer to go all out on vacation. Some to be frugal when it comes to food and more extravagent in choosing the spot they lay their head. Some like to put the majority of their budget towards diving and tours. All make sense. But if you are looking to save a bit of money on food…or maybe you like to make one meal your big meal and then snack around…here is a list that should be helpful. The general rule of thumb is: local food products are cheap, imported products expensive. Why is that bag of Doritos $10bzd in the grocery store? It’s imported. Let’s start with breakfast. As in most areas of the world, it’s generally the cheapest meal. No different here in Belize…and there are tons of options. Johnny Cakes: They are one of my very favorites. Almost like a biscuit but a bit denser. My favorite is from Celi’s Deli. $3bzd. Johnny Cake with ham & cheese. Here is the most recent picture I have of the menu. As always, the “Belizean Treats” are the best deal. And some mighty fine food. Breakfast Tacos: If you are thinking Tex-Mex or American style tacos, you are way off. 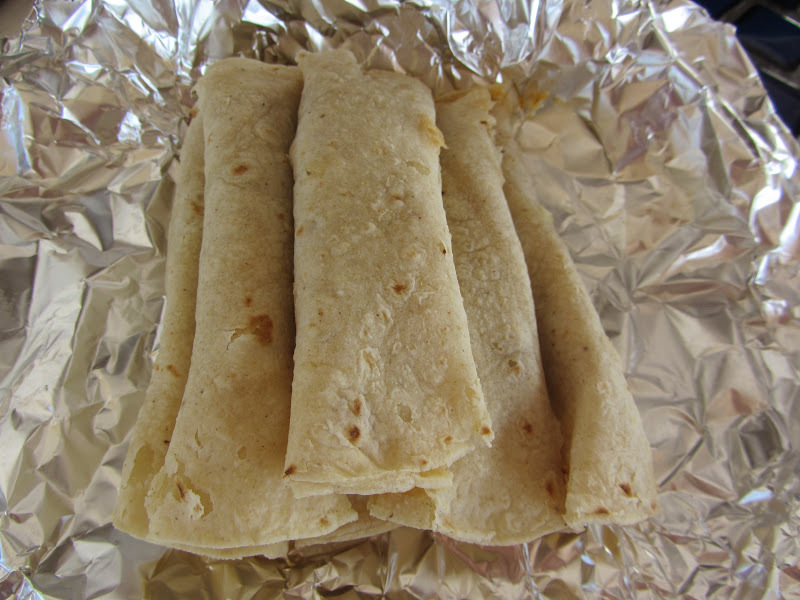 But these fresh corn tortilla rolls…made with a schmear or more of meat and some fresh onions, cilantro and chili are delicious. AND CHEAP. 3 chicken tacos for $1bzd or 2 pork tacos for $1bzd. I don’t know a vendor who would dare charge differently. When they ask you if you want “peppa” – be careful…hot can be REALLY HOT. They are generally served from 6am to about 10am all over town. There are many good places on Back Street or little vendors standing on corners with tables. Here’s a video Gay Travel Belize made of his chant. Hail him (the common way to say “wave to him” in Belize) and buy a dukunu. $2bzd. Steamed sweet corn…almost like a corn pudding/bread that’s still warm. Tasty. Soft and TENDAH! 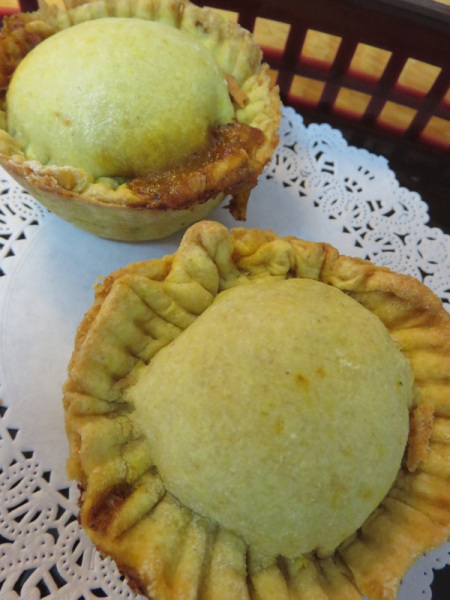 Meat Pies: Like tacos, most Belizeans have their favorite meat pie place. And just this past year there is a new guy on the San Pedro block – Boogie’s Belly. $1.50bzd for the beef meat pie. The classic. And $3bzd on Wednesdays and Saturdays for lobster meat pies. They are as good as they sound. Roasted Chicken – One of the greatest lunch deals in town. Back Street, next to the new Waruguma Restaurant, rotisserie chicken. Quarter chicken with a stack of corn tortillas and delicious fresh salsa. $5bzd. 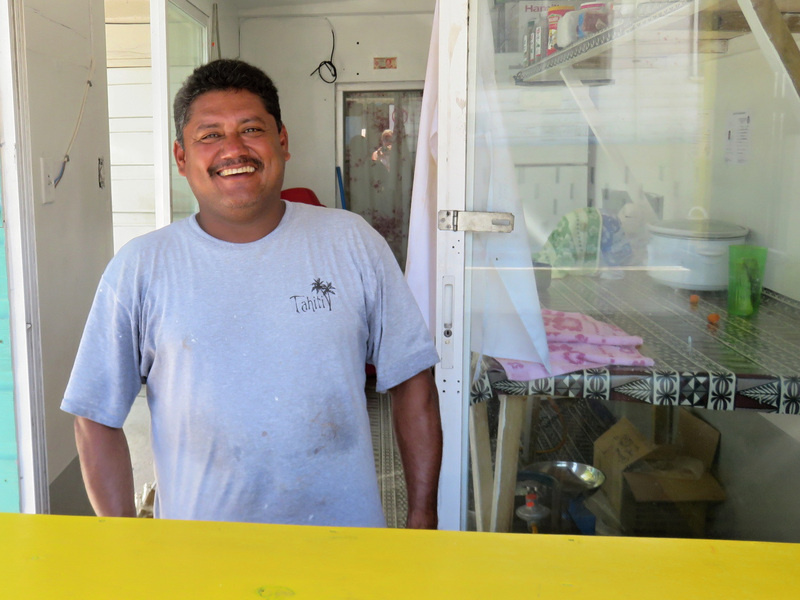 Annie’s Pastries Cart – At 3pm, the bicycle carts are packed and sent out to the streets of San Pedro. They go as far as 2 miles south and cover the north side of town up to the bridge. Listen for the bike horn honking…it’s the Annie’s Pastry cart. Chicken dip, cheese dip, pastries, stuffed jalapenos…you can get a big bag of deliciousness for about $5bzd. Pupusas – The Holy Grail of Street Food. 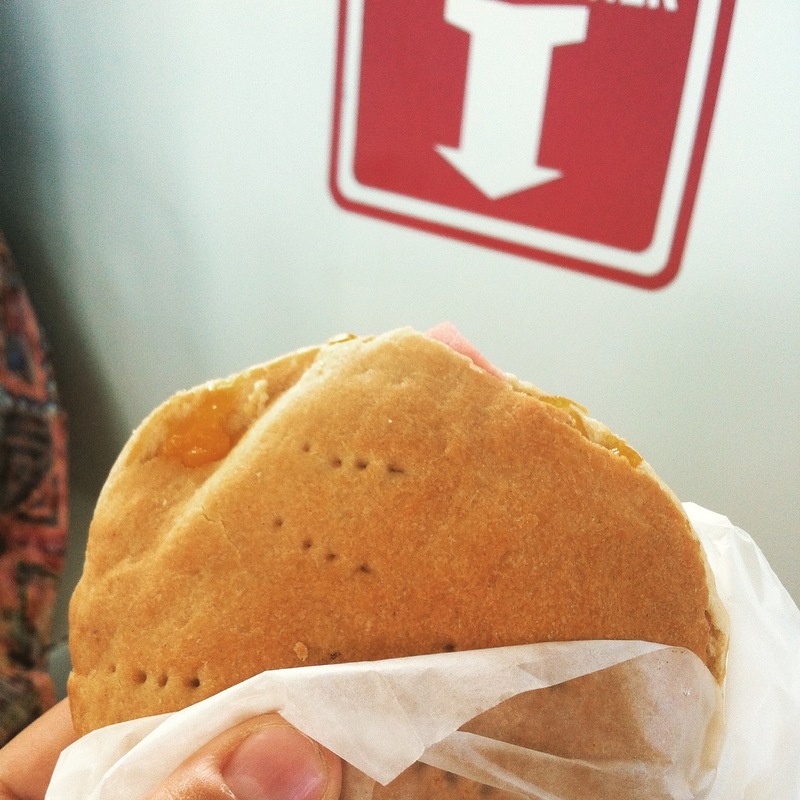 These delicious hot masa pancakes stuffed with all sorts of goodness from lobster to the typical pork, beans and cheese. I LOVE the vegetarian ones – pumpkin (like zucchini rather than squash) and cheese is my favorite. $2.50bzd on both Middle Street and Back Street in the evening. If you are south of town, try La Divinia Providence Grocery. Delicious too. 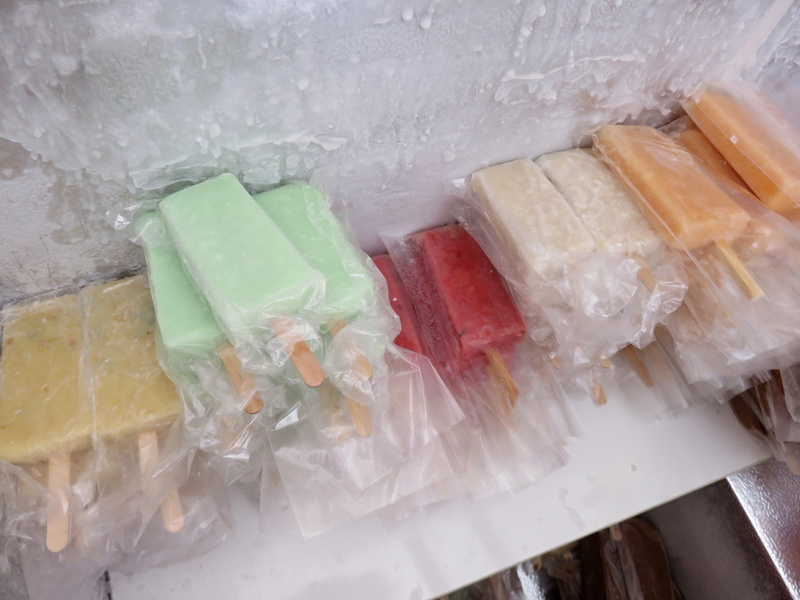 Paletas and Cookies – 50 cent cookies, $2bzd fresh fruit bars – all on Front Street at the San Pedrano Grocery Store. Read more here. 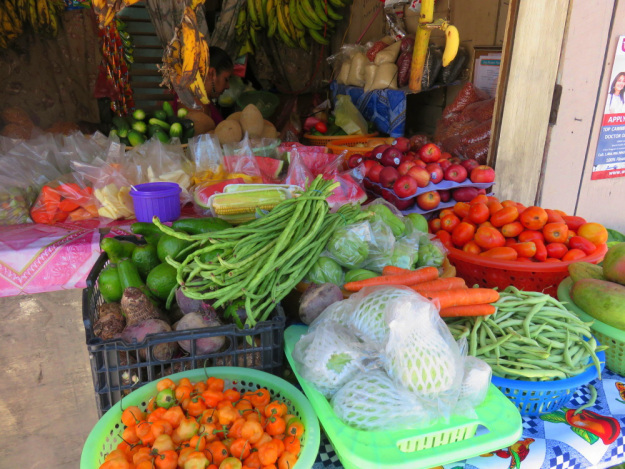 Fruit Stands: Many fruit stands in town or along the roads sell cut fruit in bags. $2bzd generally buys you some cut up pineapple or watermelon…perhaps mango or jicama with orange slices. Fruit is very seasonal here. No grapes being shipped in from Israel or Chile. If it’s not the season, it’s not the season. Bananas are always cheap…the most you will pay is 4 for $1bzd. Back Street San Pedro has lots of good fruit stands. 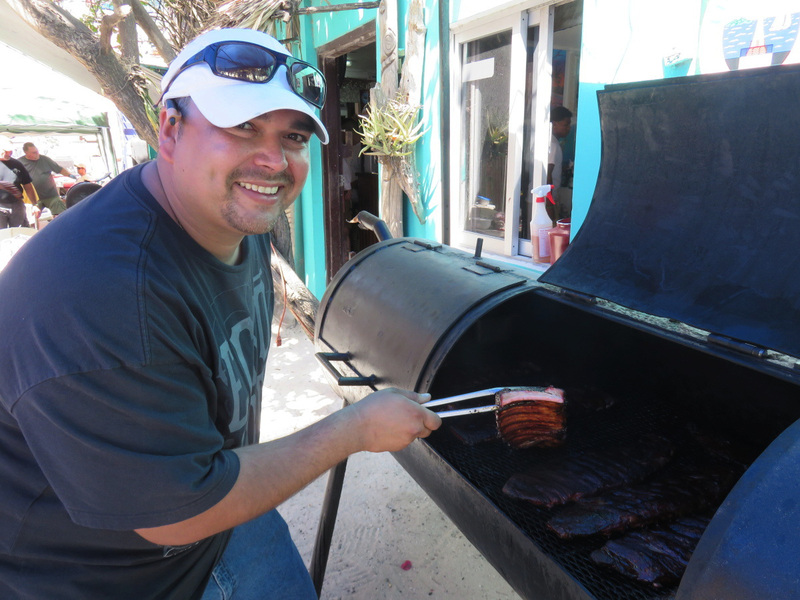 Barbecue – On weekends, in particular, BBQs are fired up across the island and you can find an $8-10bzd BIG plate of delicious food just about anywhere. Chicken, rice and beans, coleslaw or potato salad…it’s always good. 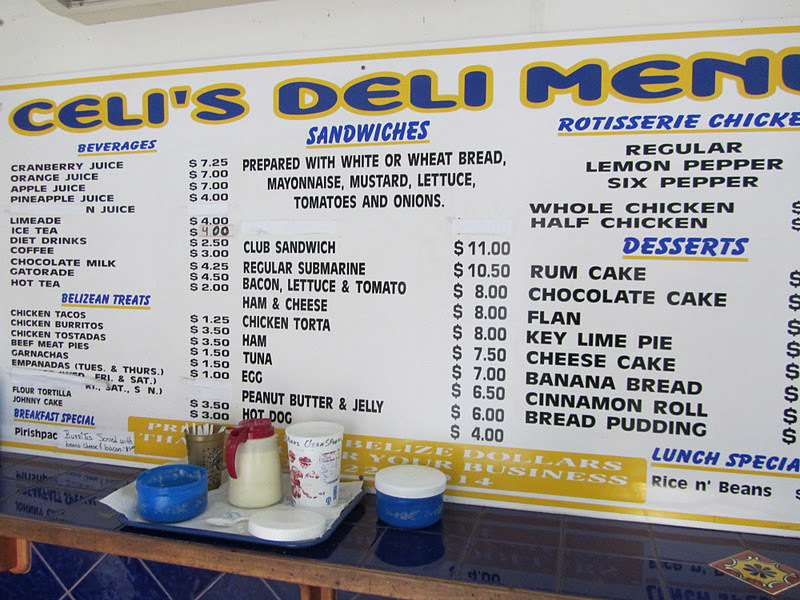 And, like with almost everything on this list, most Belizeans have their favorite spot…ask around. SOOO…when it comes to “rules of thumb” for cheap eats. 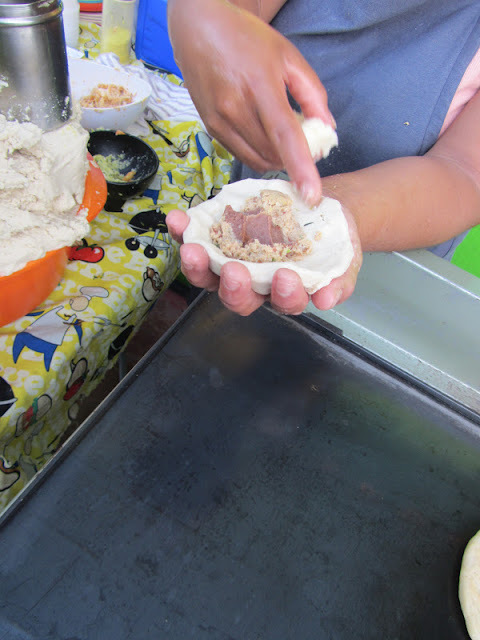 There are three: Do not be afraid of street food in Belize. Honestly. If you see a local line-up for anything, buy some. AND…like in every country in the world, people here are opinionated about their food. Ask around…you’ll find some good stuff. And, feel free to Pin this Post by clicking on the PIN button below. Awesome post! I live in Cayo but spent a month in San Pedro in March/April and was on a mission to find the most reasonably priced food. Thanks for the info! Here, you can buy 10 bananas for $1bzd! Man! Now THAT’s a deal. 5 is the best I can find on the island but then, I never need more than two! And a pound of mangosteen. $1bzd! Wow, I wish you’d written this post 3-4 years ago. We didn’t eat much street food there, and I am not really sure why except that we didn’t know about most of it. It all sounds and looks great, and the price is right. We needed someone like you to enlighten us! Ha. I’m not sure I could have written it 3 or 4 years ago. I’ve really become an eater of local food…rice & beans for at least 4 meals a week. I didn’t eat like that when I moved here…not sure why. It’s all delicious. We loved beans and rice and other local foods but mostly cooked them in our condo to save $ and because we were a bit far from town — once we’d bought our groceries, we tended to hibernate up “north”. We regret not trying more of the local food in town! Please keep the posts coming. I am looking forward to experiencing it in less than 2 weeks. Thanks for your posts. I have learned so much about Ambergris Caye and San Pedro from your blog. Look forward to experiencing it myself in a few months. Great post.But where do you find grocerie stores with local,not tourist prices? I don’t know if there is much of difference anymore. When I moved down (8 years ago), the giant Island Supermarket prices were HIGH but they had so many things you couldn’t get in other spots. (Like cereals and Doritos). Now places like Super Buy charge same to everyone…if you are a business you might get a 5 or 10% discount but…i think food is about the same for everyone. OMG there is this little place a block or two off the beaten path. They have THE best breakfast tacos. They are rolled up little bundles of GOOD. We got pork ones, 2 for a buck! I saw all sorts of locals eating there in the morning. We get up early and stumbled across this place a few visits ago. Now that is where we eat breakfast at least 2 or 3 times during our stay. I don’t know what they do to that pork, but it is delish!! The place looks like a little shack of a place with picnic tables out front – if you come across it – go there! YUM. Heading to San Pedro in a month with my sister and our girls. Any suggestions/tips? more worried about safety than anything. Unless you are heading out late at night, I really think you don’t need to worry too much about safety. And if late at night, just stick to the lighted ways…don’t walk on the beach alone in unlit areas…the usual precautions that you would take in many places. If it’s mid June, hit the lobster festival! So many good places to eat along the streets in San Pedro. There is only one we have found that you would make a TERRIBLE mistake going to: Billy’s (formerly Ali Baba’s) next to the airport. DO NOT go there – the food is border-line food poisoning in quality, and the owner has to pay locals to draw them into his lair so he can try to rip you off.. Seriously avoid this one like the plague. it’s terrible enough to put in your phone as a reminder of where never to go! 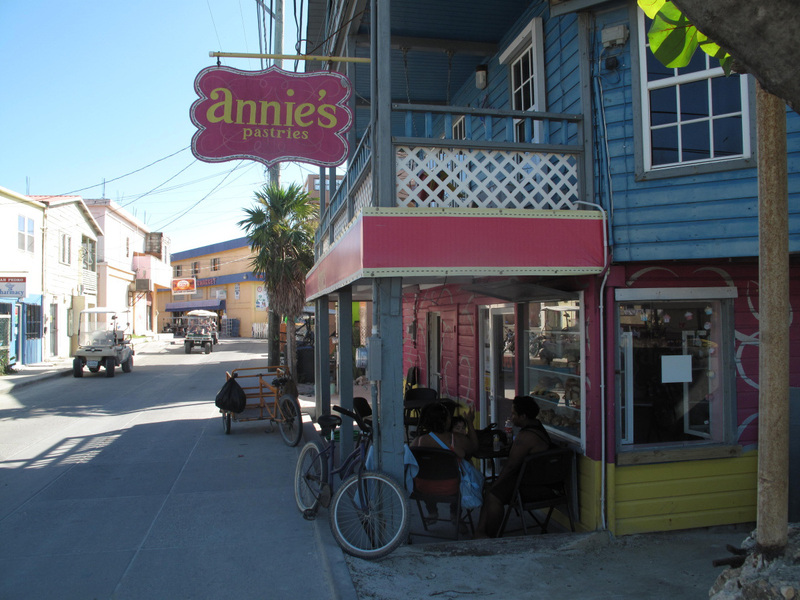 We have been to Ambergris Key 5 times now and love almost everywhere in which we have had the pleasure to eat! However, I must warn everyone who plans to travel there about this one: Billy’s near the airport (formerly Ali Baba). DO NOT go there – the food is border-line food poisoning in quality, and the owner has to pay locals to draw them into his lair so he can try to rip you off.. Seriously avoid this one like the plague. it’s terrible enough to put in your phone as a reminder of where never to go! He will try to rip you off around every turn, from short changing you to see if you notice to selling you food you didn’t get. This is a public service and health announcement for all Amergris Key tourists!